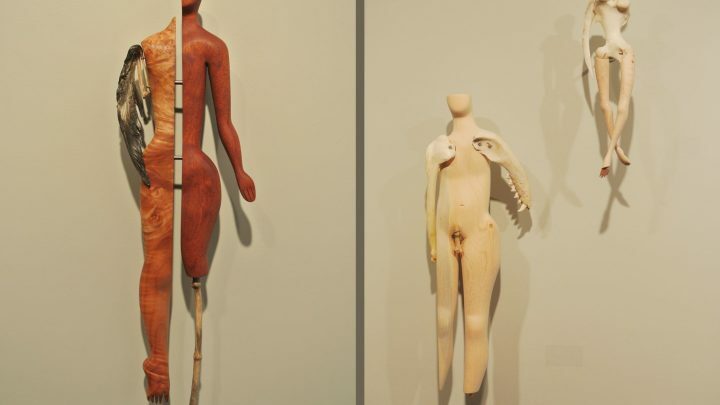 Constructed Identities, a major show of new work by Persimmon Blackbridge, uses mixed media wood carving with found objects to question how disability is framed as a fracturing of ordinary life rather than a normal, expected part of it. Her exploration of the figure begins in disability, but necessarily complicates itself as our embodied identities intersect and overlap. Blackbridge has been awarded the Ferro-Grumley Fiction Prize, the VanCity Book Prize, the Lambda Literary Award, the VIVA award for visual arts and the Emily Carr Institute of Art and Design Distinguished Alumni Award. Her art has been shown across Canada and the U.S., as well as in Australia, Europe, and Hong Kong. She lives on Hornby Island in British Columbia. Guided tours: February 9 at 1:30 p.m., 2:30 p.m. and 3:00 p.m. Registration encouraged, drop-ins welcomed.